If you haven't already noticed, here's how we approach PPVs in WWE, whether they be RAW or SmackDown (but especially RAW). They start building the card, usually giving importance to and announcing the main event and upper midcard matches first in the next show after the last big event. They'll start building and building up; sometimes it might seem like they're forgetting the midcard. Sometimes the build won't be anything hot at all, and when that Sunday comes we'll be tuning in out of obligation, a need to find out what happens in the story. We'll come in with no expectations, and then be blown away by how good the wrestling generally is. Why wouldn't we be? WWE's amassed a roster of the best wrestlers from around the world. The only catch is sometimes, if we're lucky, we also get the results we want. Or, at least, the results we expect. The truth is great wrestling can forgive a multitude of sins, but it can't get you all the way to where you need to go if you don't head there yourself. No Mercy was another great example of lazy, coasting booking that the RAW brand is popular for. Where NXT gives people the things they never thought they wanted and SmackDown at least works harder in justifying the decisions they make, the red show seems to like imposing its own way more than ever, insisting on things like Lesnar retaining the championship clean, Finn Balor and Bray Wyatt continuing their lukewarm feud, John Cena yielding to Roman Reigns after only one match, Reigns not even showing any noticeable character growth, among others. Of course, business shouldn't solely rely on the company giving exactly what the fans want the entire time. There has to be a proper push and pull of things so that tension remains, and satisfaction eventually comes out of that tension. But what happens when that edging takes too long, that carrot has been dangled in front of us too much? What happens when there's no more goodwill left to allow things the Powers That Be want? How do you think SmackDown can really get away with putting a championship on Jinder Mahal? After one month, it's still the RAW Tag Team Championship match. As the late Chris Kanyon once said, who betta, right? At the risk of devaluing other dedicated tag teams (but also given the long-term benefit of making everyone else they face better) this is what happens when you put four of your best singles wrestlers in the division and make them be tag team specialists. They've literally put their bodies on the line just to entertain you (Cesaro himself paid with his front teeth), and the dividends are rightfully huge. So after a straight, clean win, we've established that Braun Strowman is now running in place. 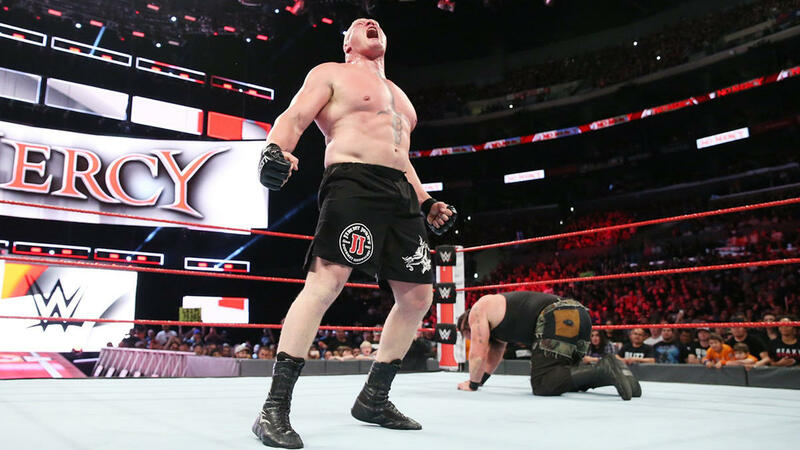 There could've been a wrinkle in his loss for him to work on in an arc moving forward, but there's literally nothing for him to do or dispute now that we know Lesnar isn't showing up again for the rest of the year. That Intercontinental Championship match is the best match Jason Jordan's had since coming to RAW, and I'm glad he was able to put out a match like that in his first PPV appearance as a singles wrestler. He brought it, for sure—and now creative has to build around him, no matter what they want him to be, to make the most of his talent. Alexa Bliss retaining the RAW Women's Championship isn't a bad idea, but the notion of a Fatal Five-Way is really just a means to throw everyone in when they don't have a solid idea for a singles feud. Yes, it maximizes the division on a bigger scale, but the successful title defense betrays a lack of direction. John Cena vs. Roman Reigns was actually a great match, but apparently having the full stop after it felt so flat. Being able to kick out of two straight AAs isn't really maturity, it's just kicking out of two finishers. Although after that, I see why Cena's proud of him. Enzo Amore winning the Cruiserweight Championship, while absolutely detestable, makes sense as a move especially after what happened on RAW this week. It's really just one of those things that's designed to get you to talk about 205 Live more, and with this week's development, they at least got that accomplished.